Last Week | EAT MY PLANTS! Only a couple of Cauliflower plants actually came up. I’m presuming the conditions were too cold for them. 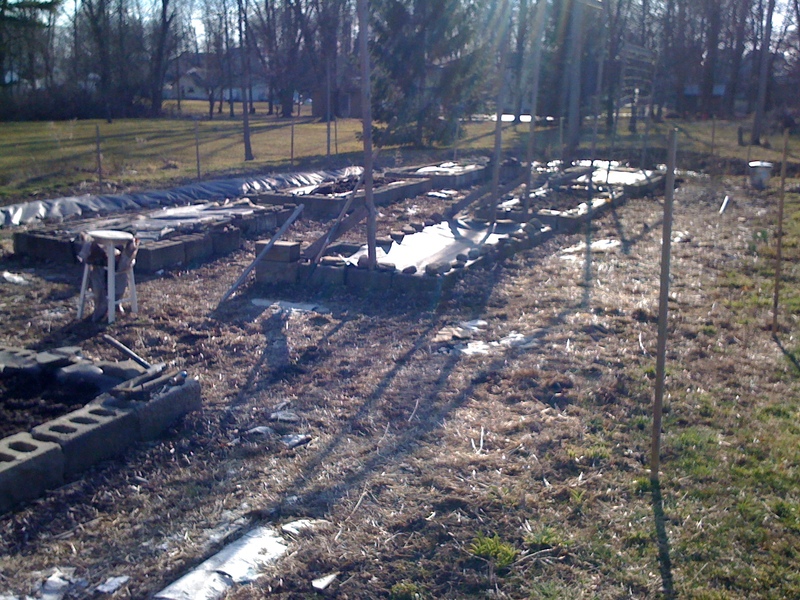 I’m taking what I got and waiting until late Summer to plant the others for a Fall crop. Only a couple of the Cauliflower ever came up. The Cabbage competition has begun. I did cut one already. Maybe tomorrow I’ll make a few more selections. Snowdrops are starting to die back already. I’m really hoping they come back in greater numbers next season. I didn’t have enough material to fence the front flower bed and the garden. I had to pick the garden. I’ll have to find a method for fighting the deer this season. Right now the crocus, tulips, and hyacinth are unprotected. Here’s another look at the garden into the setting sun. We just pounded in the posts. Deer can step right over it, but it’s worked in the past. We’ll see. Dave helped me set the stakes for the deer netting. We had to pull out the tall Morning Glory poles and move them away. Last season they climbed right onto the deer netting and started pulling it down. 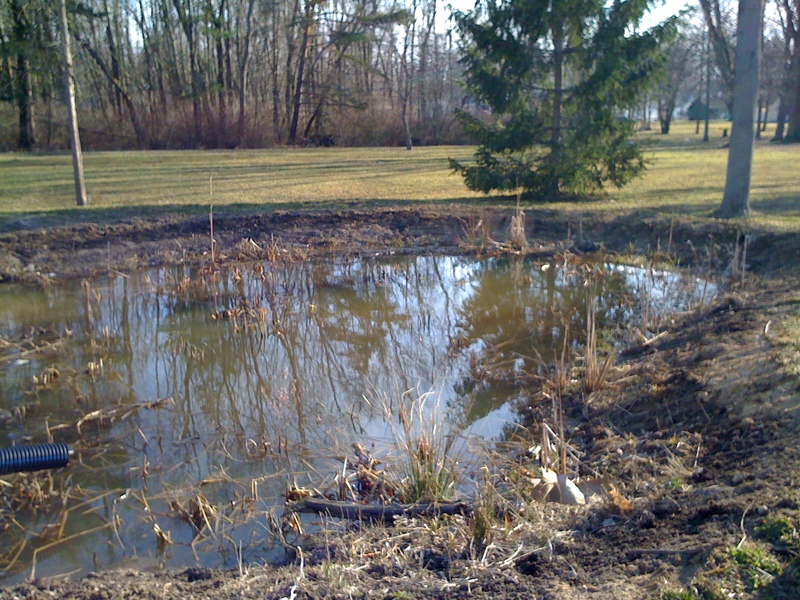 The pond looks naked but the Irises are coming up. In a month or so this will look entirely different. I can already tell that the Cattails are taking over. We have to pull a few of them out. 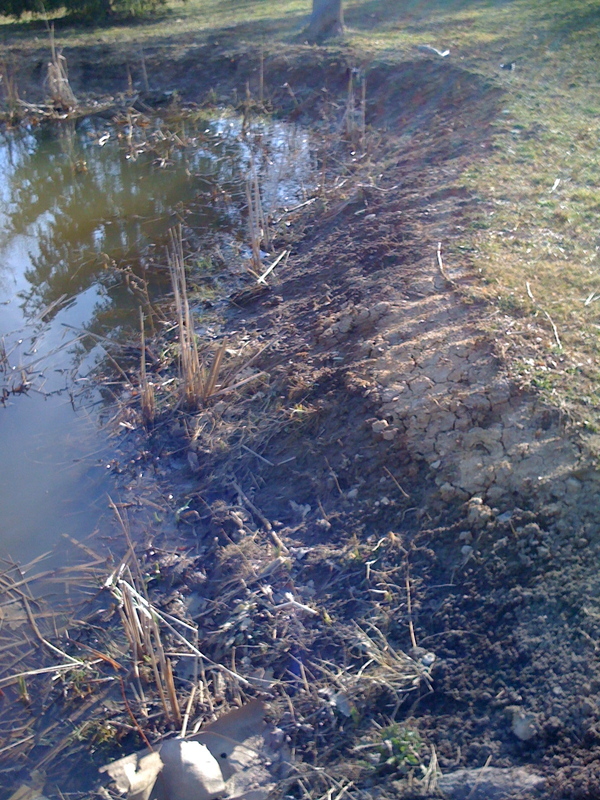 I still have to find an aesthetic solution for drain pipe that feeds the pond. 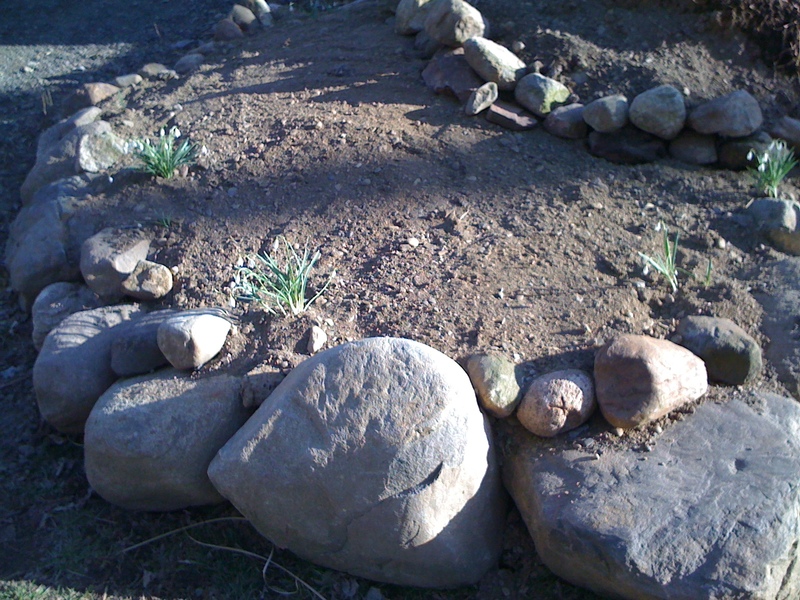 The Irises line the whole edge of the pond. This year they will probably bloom. It’s the second season after they went in. 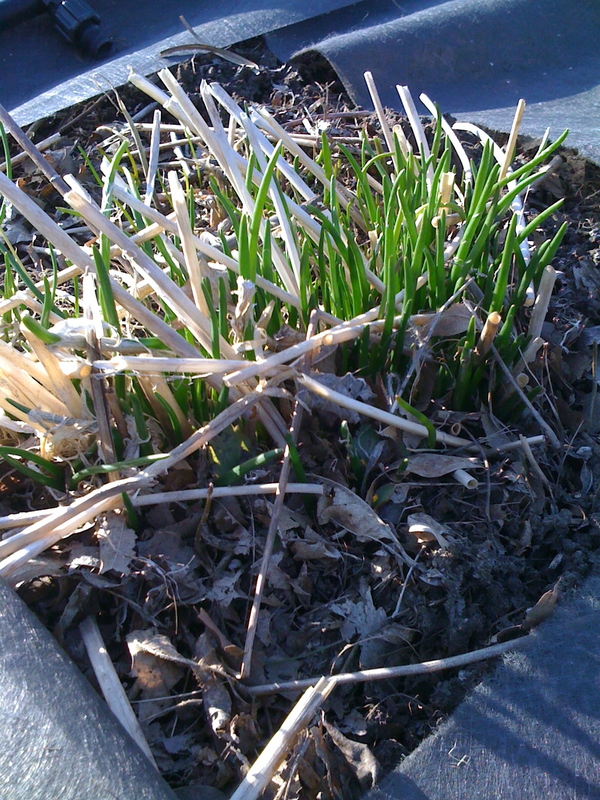 The Onion Chives are not far from being ready. They grow really fast. 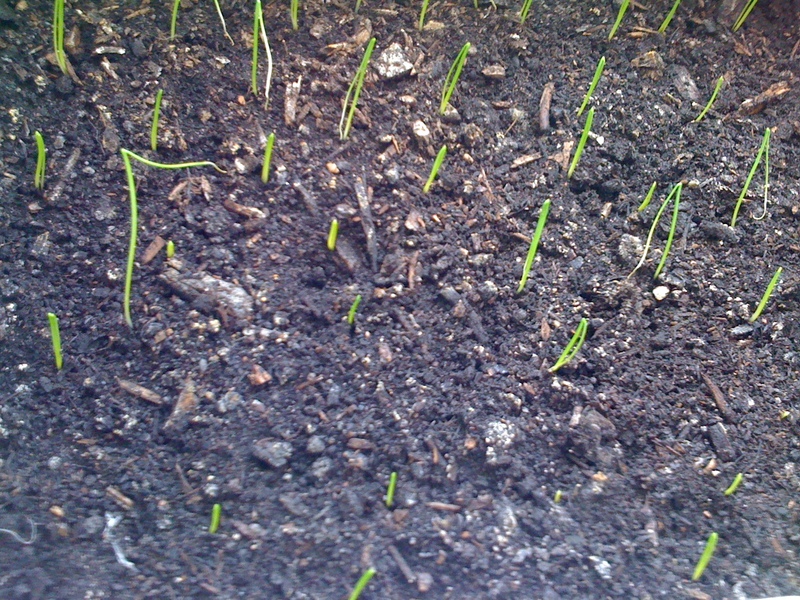 This is the first season after planting the Garlic Chive seeds last year. They are opposite the Onion Chives. 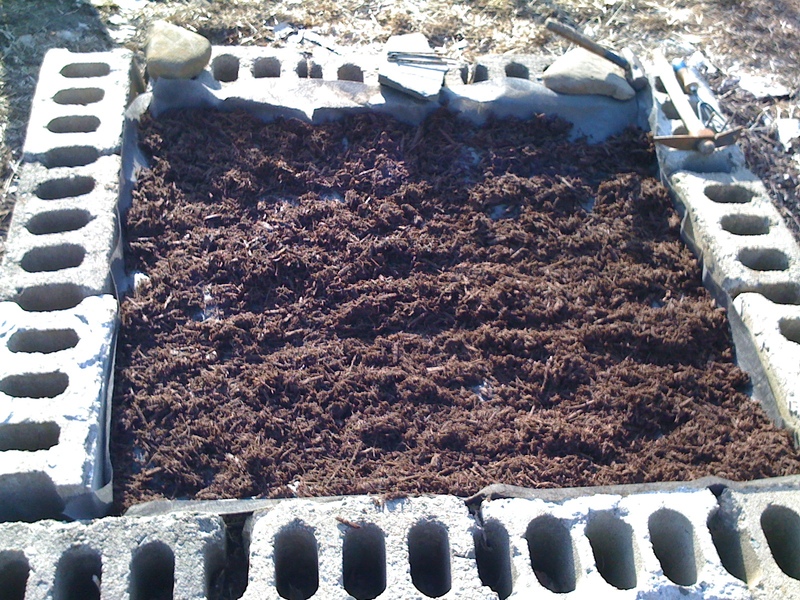 I had some Cedar Mulch from last season. I wasn’t going to use it in the garden but I decided to put it on a few beds to warm the soil. I have straw on the other beds to keep them cooler. 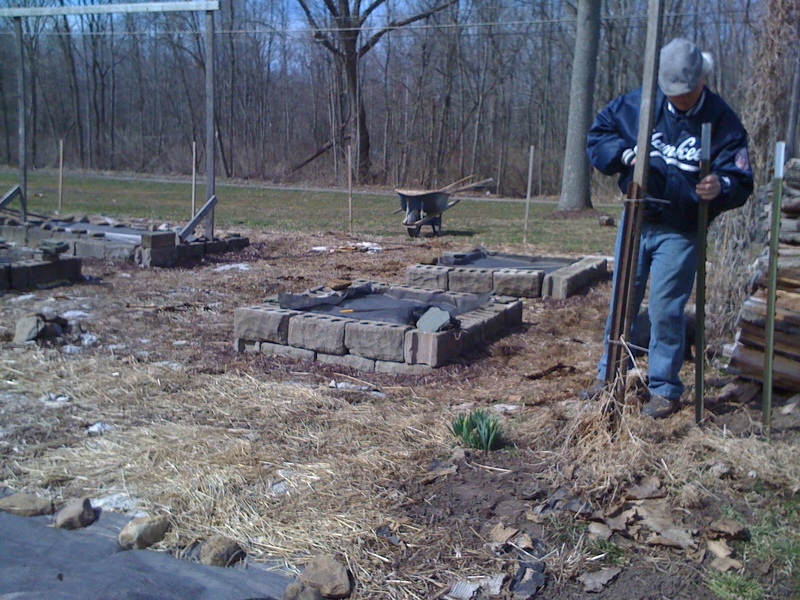 All these blocks that make up the beds were reclaimed from the building we took down on the property. They serve this purpose well. 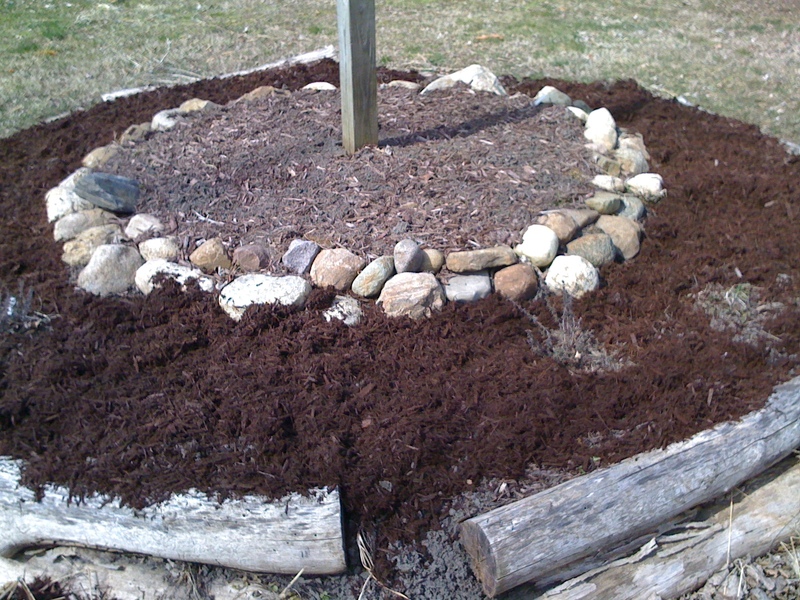 I mulched the round bed with some of the cedar mulch left from last year. There’s no landscape fabric on this bed. The Oregano and Thyme are coming back strong from last year. I’m not sure what I’m putting in here yet. The 2 little square beds don’t have any hydration systems going to it. These are fed by rain or manually. I am unsure what I will put in here yet. The outer edge has Snow Peas in a row. 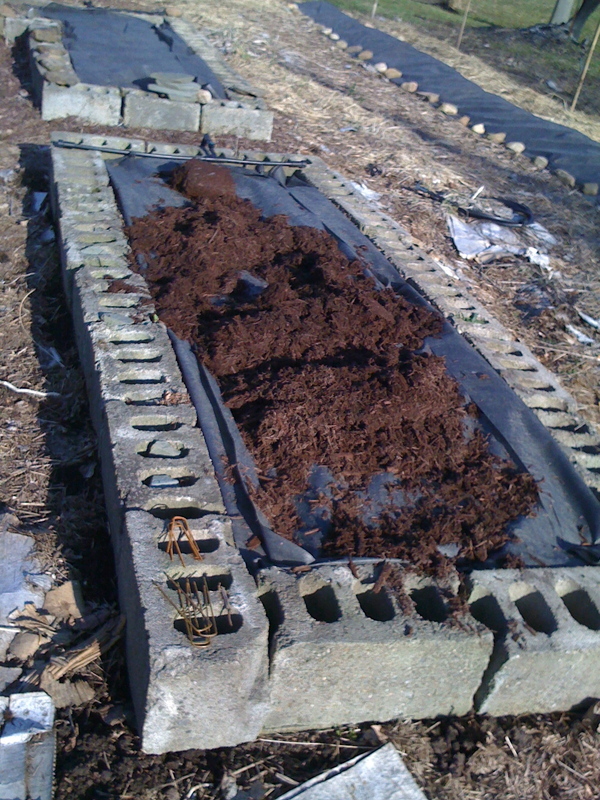 I peeled back the fabric and mulch since peas prefer it to be cooler. 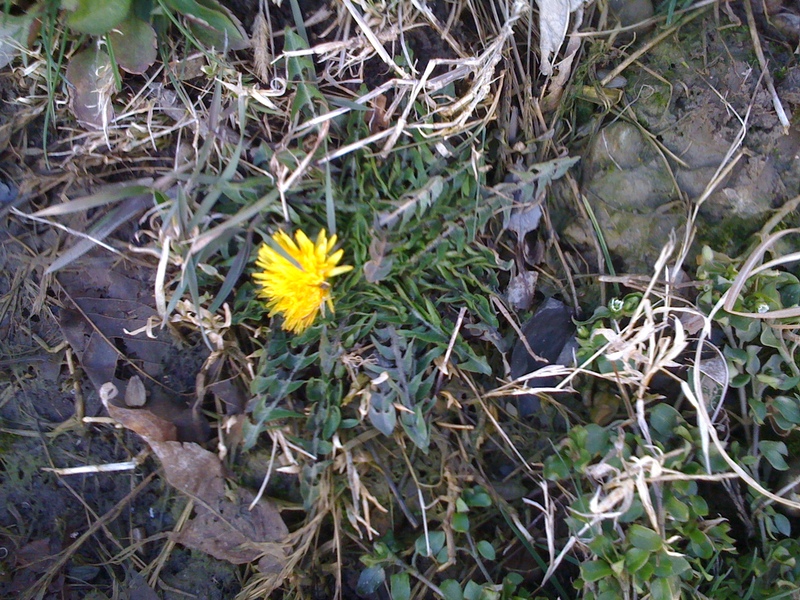 Dandelion already? It’s really unusual to see Dandelions this early. This is where the sump from under the house feeds. The water is warmer all Winter long and definitely this time of year. This is where the Dandelion is growing. One man’s weed is another man’s supper. Throw it in our salad? These are Snow Peas I saved from last season. I planted maybe 20 of them already in few spots. I learned that you need to grow a lot of them. It’s easy to eat a pint raw as your picking them. 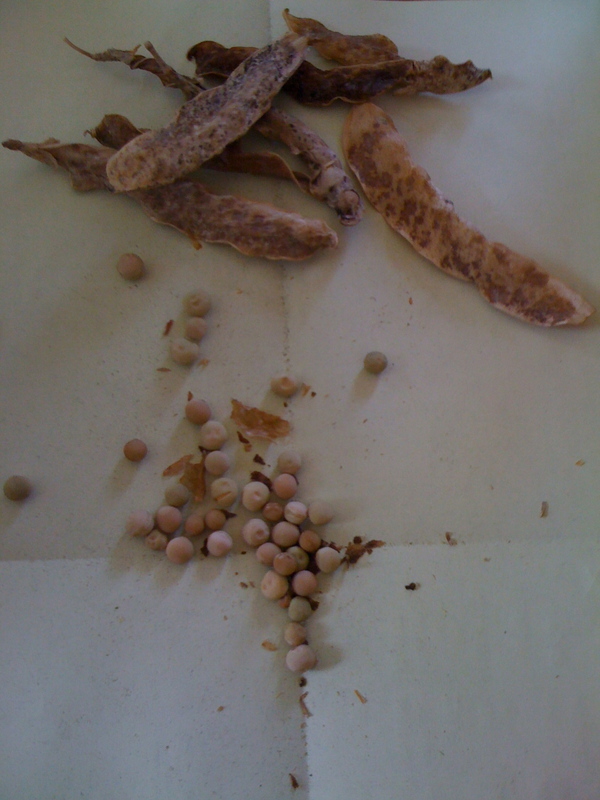 Here’s another look at the Snow Peas with their husks. 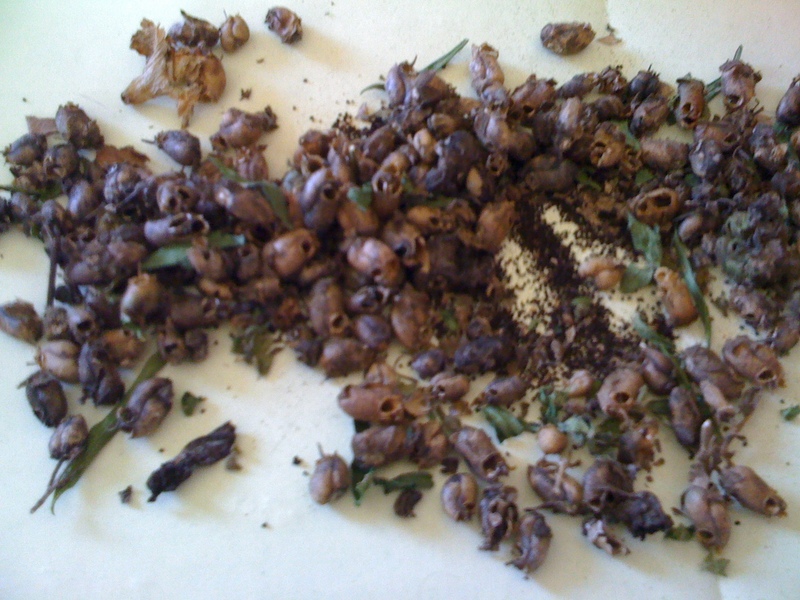 I have thousands of Snapdragon seeds. They’re all mixed colors. I did, however, keep one color separated. It was a rust color with yellow highlights. It was the only ones I had of that variety. I had no idea these were perennial. 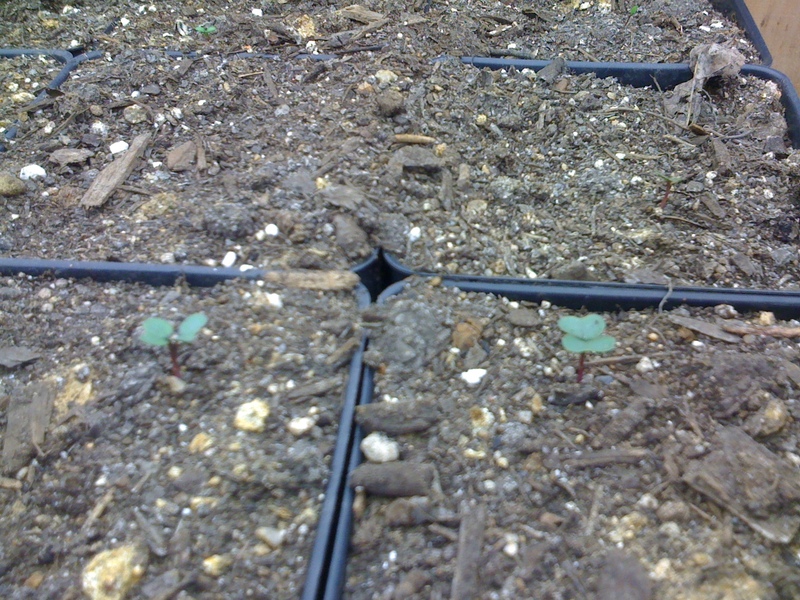 They also reseed really easily since each pod has 50 or more seeds. 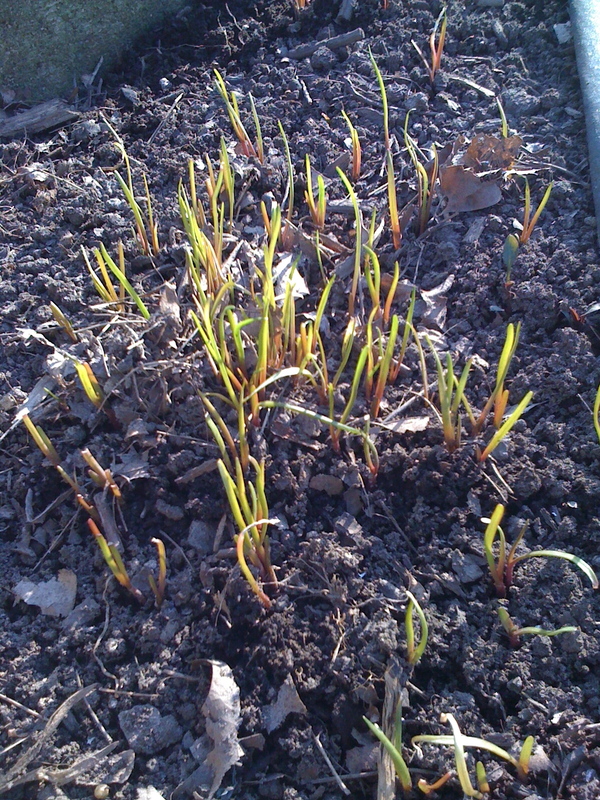 The Walla Walla Onion seeds are up. 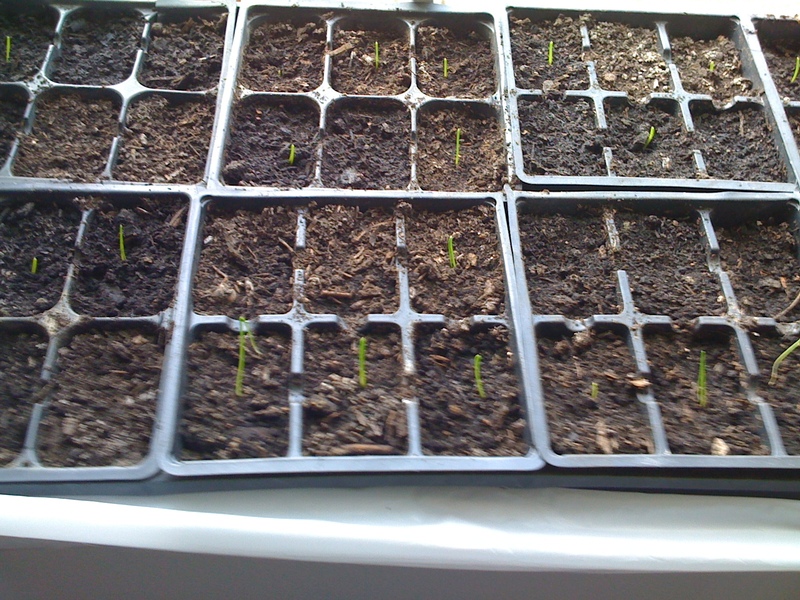 Another batch of Walla Walla Onion seeds have sprouted. I will still get some sets of another variety that stores well. These Sweet Onions need to be eaten within weeks of harvesting. That’s really no problem. 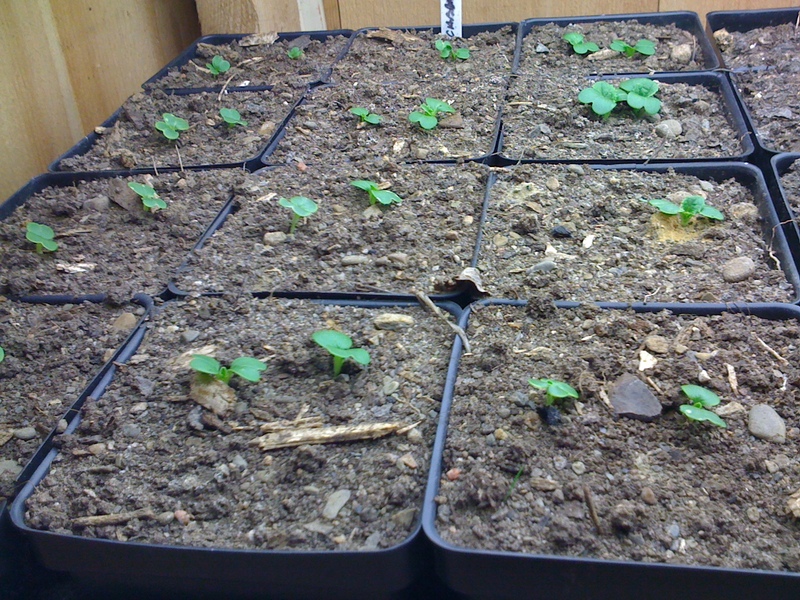 I collected seeds from the annuals that were around the driveway last season. I really don’t remember what they were for the most part. 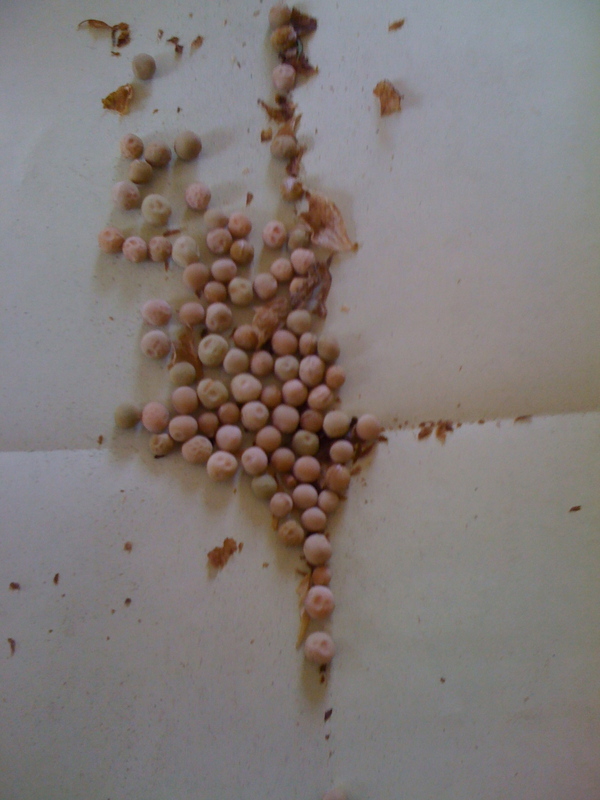 I did, however, keep the seeds from each plant separated. As they mature I hope to identify them. I have a few flats going upstairs in my house. 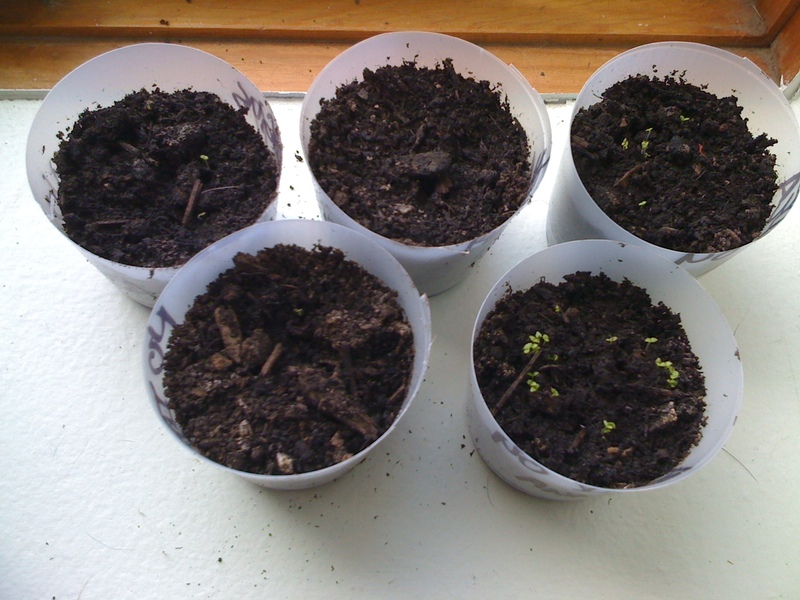 You can see some of them already sprouted. The Hot Oregano plant I purchased locally last season didn’t seem to do well through Winter as the other variety has. 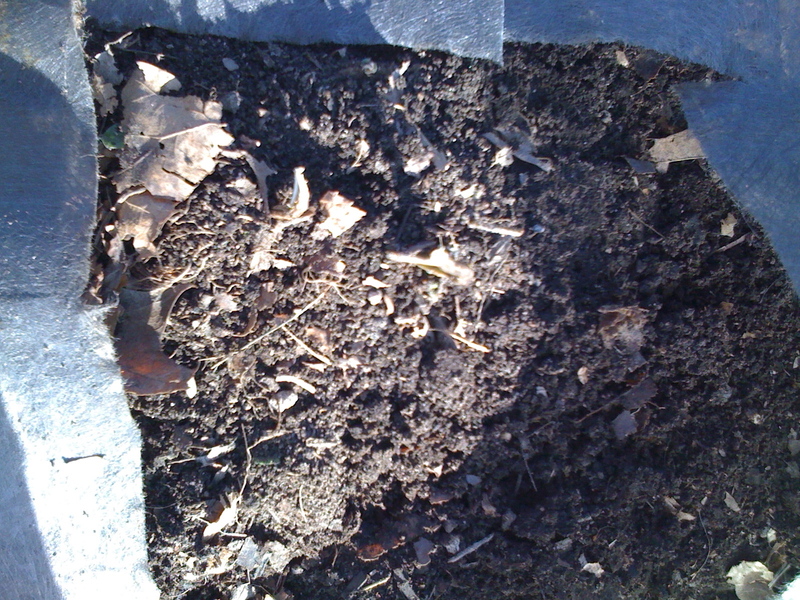 I left the roots in here just to see if there’s any progress as the season warms. I want to wrap up with a look at the Crocus. They open up everyday when the sun hits them. On the North side of the house in morning and when the South side gets the sun, the North closes and the South opens. These are on the South. 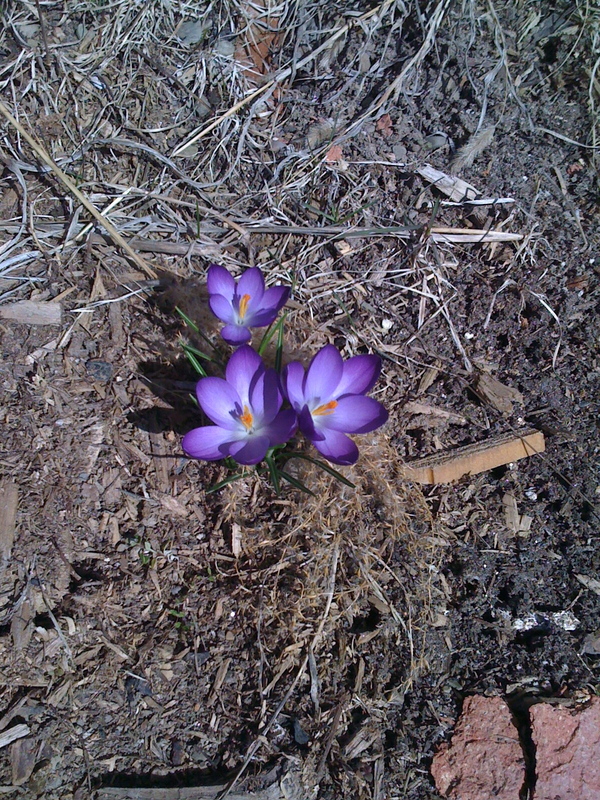 Also South side Crocus. Sounds gangsta. South side, yo. These are near the white ones pictured above. 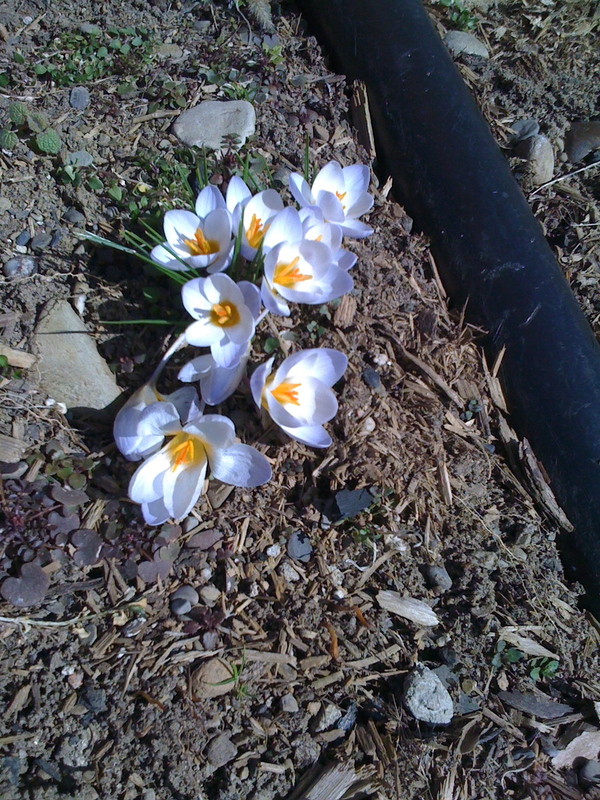 These are my favorite Crocus so far. Also on the South side of the house. I picked up some straw this week from a local farmer outlet and have more coming from a friend later this week. I am unsure if I have enough netting for the garden yet. 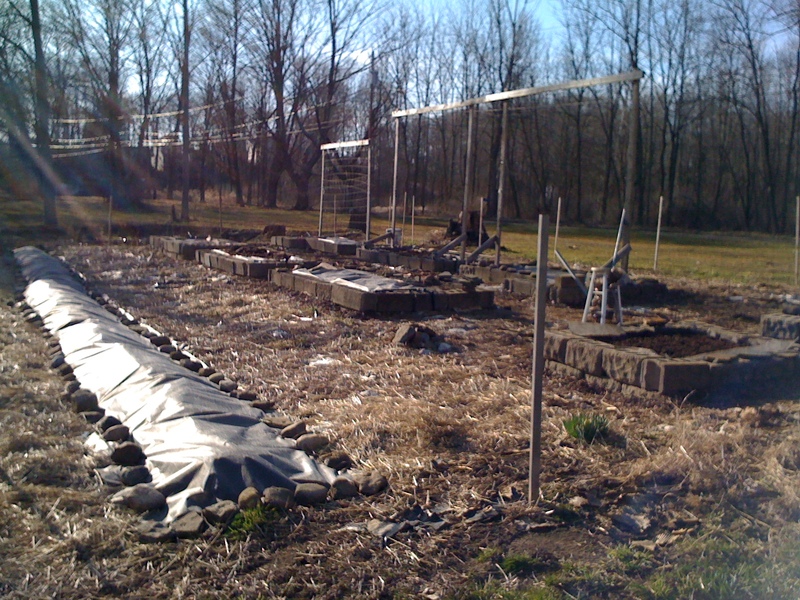 I’ll also get Carrots, Radishes, and Spinach in the ground this week as well as my Chamomile patch. I’ll keep taking pics along the way to share. Soon I’ll get to doing some video. Time Lapse would be really cool. As always, thanks for reading and feel free to Eat My Plants! ← Galanthus! 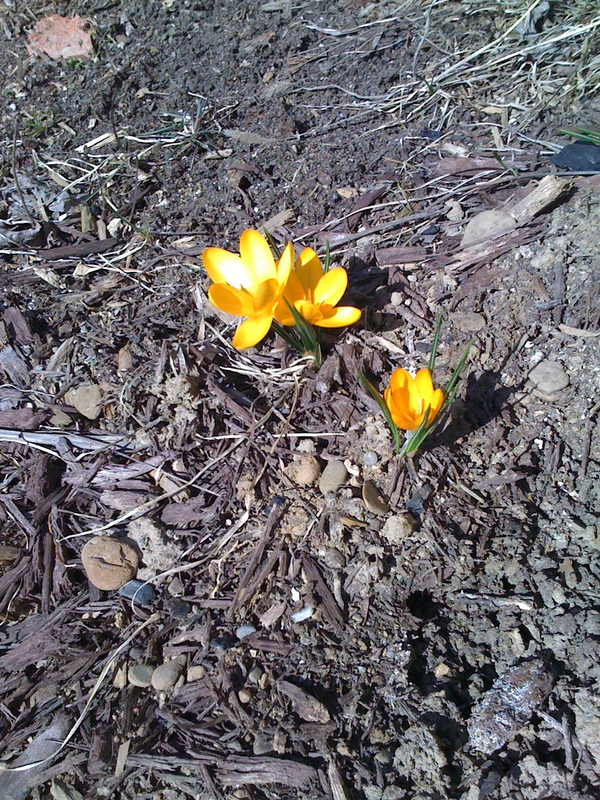 Sooner than Crocus!